DIY Clay Mask for Mosquito Bites -- A Great Homemade Treatment that Works! DIY Clay Mask for Mosquito Bites — A Great Homemade Treatment that Works! Whip up a homemade treatment for mosquito bites with just three simple natural ingredients to reduce the itching, redness, swelling, and pain. Our family just enjoyed a trip to Washington, D.C., for the most part, that is. With 100° temps and humid nights we were unlucky enough to encounter mosquitoes. Lots of them. Unfortunately, my daughter has what could almost be considered an allergic reaction to these pesky little creatures. The bitten area becomes immediately hot, painful, and inflamed and the redness continues to grow and radiate out from the bite. This lasts for a good few days unless it’s treated immediately. The fix? A homemade clay mask I’ve found to be indispensable. It consists of bentonite clay, witch hazel, and French lavender essential oil. So, if you’re unlucky enough to get bitten by mosquitoes this summer, give this simple DIY treatment a try. 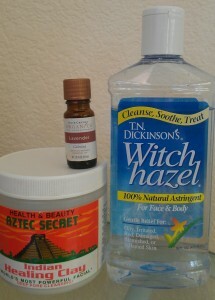 Mix a little witch hazel into some bentonite clay to form a smooth paste. Blend in the essential oil and then apply a thick layer (1/8 – ¼ inch thick) to the area on and around the bite. Let it do its magic for around 15 – 20 minutes until dry. Then apply a wet washcloth to the area to help loosen the dried clay and rinse it off with cool water. Don’t be alarmed if the area is red once the mask is removed. This is typical and should go away within minutes. However, if you experience a rash, discontinue use. Afterwards, gently rub a drop of lavender essential oil onto the mosquito bite for continued relief from itching. By the way, if you’re in a pinch and all you have on hand is just one or two of the above ingredients, go ahead and give them a try. They will still definitely help. You can always use plain water in place of the witch hazel. And if you don’t have any lavender essential oil on hand, simply leave it out. Bentonite clay, which is also used in naturopathic medicine for detoxification purposes, helps draw out the impurities and toxins from the mosquito bite. The witch hazel, which is a hydrosol made from the shrub Hamamelis virginiana, helps calm the redness, itching, and inflammation. French lavender essential oil helps with itching and scratching. In addition, it also calms the nervous system, which is always helpful if you have multiple mosquito bites! Tip: Pack a little of the bentonite clay, which is in powdered form, in a baggie for your purse, briefcase, car, and/or first aid kit. That way you’ll always have it on hand should you need it. advice and information to protect ourselves. that’s sweeping certain parts of the country!!LOL! Thanks. You know, this summer heat is unbelievable, isn’t it? And if you’ve got rain and extra humidity with it, out come the mosquitoes! Wow! I tried the clay part and in 20 minutes my bite wasn’t itchy at all and hours later it completely disappeared! I also used it for my acne, because it couldn’t have gotten any worse haha, and it rid my face of dead skin! Hi Manu. I’m so happy to hear you tried the clay mask and found it took the itch away! Also, happy to hear it helped with your acne. My family swears by this remedy. We always pack the clay when going camping to deal with any pesky mosquito bites. It really does reduce swelling, redness, and itchiness.